Green Lease Leaders Application Period Extended to April 5. Apply Today! The deadline for the 2019 Green Lease Leaders application period has been extended to April 5th! Landlords, tenants, and real estate transaction teams that achieve the Green Lease Leader designation will be honored in June at the 2019 BOMA International Annual Conference & Expo in Salt Lake City, presented with an official certificate and seal for their achievements, and featured in a national press release and social media campaign. Commercial, industrial, and retail landlords and tenants, as well as transaction teams (a combination of landlord, tenants or brokers for a single real estate deal) are eligible to apply for Green Lease Leader recognition.The Green Lease Leader designation is valid for three years, after which all recipients must reapply to maintain their status. Run by IMT in conjunction with the U.S. Department of Energy’s Better Buildings Alliance, Green Lease Leaders is the industry recognition program for companies are taking on high-performance leasing practices to unlock shared energy savings, sustainability improvements, and business benefits in buildings. Now entering its sixth year, the program has recognized landlords, tenants, and real estate teams in the commercial office, retail, and industrial sectors representing more than 1.8 billion square feet of space for their accomplishments. 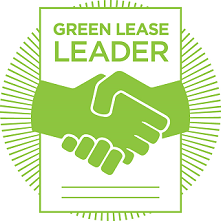 Learn more at www.greenleaseleaders.com.